The Judicial Service Commission (JSC) and Judiciary leadership led by Chief Justice David Maraga held a successful meeting with the Committee on Delegated Legislation of the National Assembly under leadership of Gladys Boss Shollei. 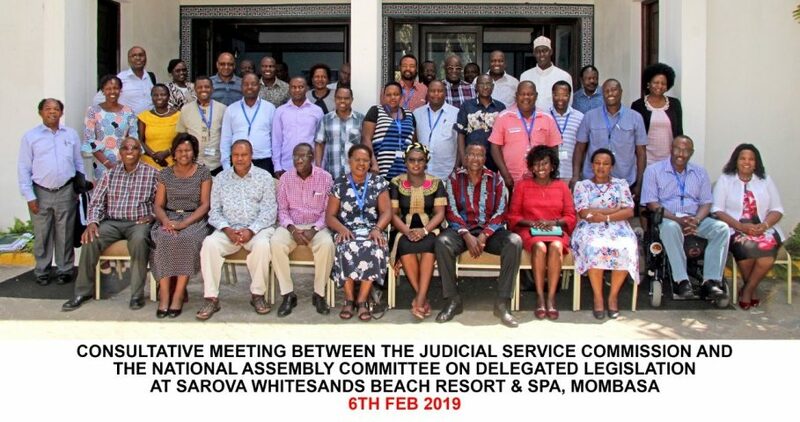 The meeting held on February 6 in Mombasa, discussed the Judiciary Fund Regulations and the Code of Conduct for Judges, Judicial Officers and Judicial Staff. The Commissioners who were present during the deliberations were: Deputy Chief Justice Philomena Mwilu, Justice Mohamed Warsame, Justice Aggrey Muchelule, Hon Mercy Deche, Hon Patrick G. Gichohi, Hon Prof. Olive Mugenda, Hon Felix Kiptarus and Chief Registrar of the Judiciary Anne Amadi. Court of Appeal President Justice William Ouko, High Court Principal Judge Lady Justice Lydia Achode and Registrar Magistrates Court, Hon Peter Mulwa, also attended the meeting, among others.